What skulls am I talking about? Well how about for one: A Kodo skull. Kodo were a native species to Kalimdor. They didn’t come through the Portal with the Orcs during the first or second war, and this skull is way to big to belong to one of the smaller Kodo that serve as mounts to the horde. I mean, we’re talking about Barrens/Desolace wild kodo here. So how the heck did its skull end up in Outland and impaled on a spike? 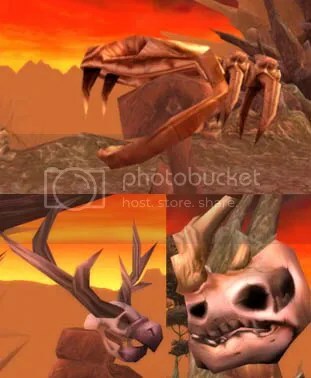 The first time I saw this I thought it was possible a Clefthoof skull, but the distinct horn on the nose cannot be found on any of the Clefthoof in Outland. They have more of a boney bump sticking out of their face that a defined horn. The other skulls aren’t much better in terms of lore. One is a moonkin skull. A MOONKIN. You know, the fat little owlbears that the goddess Elune sent to Azeroth to protect sacred sites and relics? How the heck does a Moonkin get into Outland? Does Elune serve as a deity in this world too? Was there some sacred relic to protect in the middle of the mountains? Once again, my first thoughts turn to a more logical explanation. After all the Cenarion Expedition, a druid group, is camped out on one side of the bridge. Maybe one got killed in Moonkin form and their head got plastered on a spike as a warning. But alas, druids do not maintain shape upon death, as anyone who PvPs can tell you. So it would have to be a night elf skull or tauren skull up there. So it has to be a moonkin skull. Finally, there’s the giant snake skull. Now there are lots of giant snakes across both Azeroth and Outland. Granted, very few of this size. The exception of course being in skeleton form. There’s lots of snake skeletons across Azeroth. From Ashenvale Forest to Stranglethorn Vale. Now, I’m not entirely sure how this giant snake skull ended up in Blade’s Edge. When most of the giant snake species in Outland seem to be mostly in Terrokar and Nagrand (and generally in the employ of the Shadow Council) but I’m not going to say there are no giant snakes in Outland. I am however curious as to how its vertabrae are still attached with no sign of gravity whatsoever. Shouldn’t have those few neck pieces fallen down at some point? What really gets me curious is how long have these extremely random skulls been up there? They have no sign of skin or decayed flesh left on them, they are bleached by the sun. Exactly when did these skulls arrive? Two of them are for sure not from the region (and not from this world in any case) but they’re presented as if they had been here just as long as every other random bone we find in WoW. With the undecaying dragons, it makes them seem like they’ve been here even longer! The only explanation I can possibly think of is that one of the first people through the Dark Portal was a showman. That’s right! A bonefide sideshow showman! And he’s got some Straaaange things from ANOTHER WORLD! World! world! Step right up, son! It’ll only be four silver pieces to see skulls of actual alien creatures! Guarenteed to scare and entertain any age! But somehow I don’t think the Black Dragons of Blade’s Edge (or the Ogres for that matter) were very entertained by this. Probably ate the showman and decided to use his wares as a warning to those who crossed their bridge (Got to stop those bloody billy goats). So to this day the very exotic and strange skulls of the anonymous traveling showman have stood upon spikes at Wyrmskull Bridge, amusing anyone who wishes to spend the four silver pieces and pledge their undying loyalty to the Blackwing Coven. Posted on February 19, 2010, in Oddities, Outland and tagged blades edge, kodo, moonkin, Outland, skulls, snakes. Bookmark the permalink. Leave a comment.